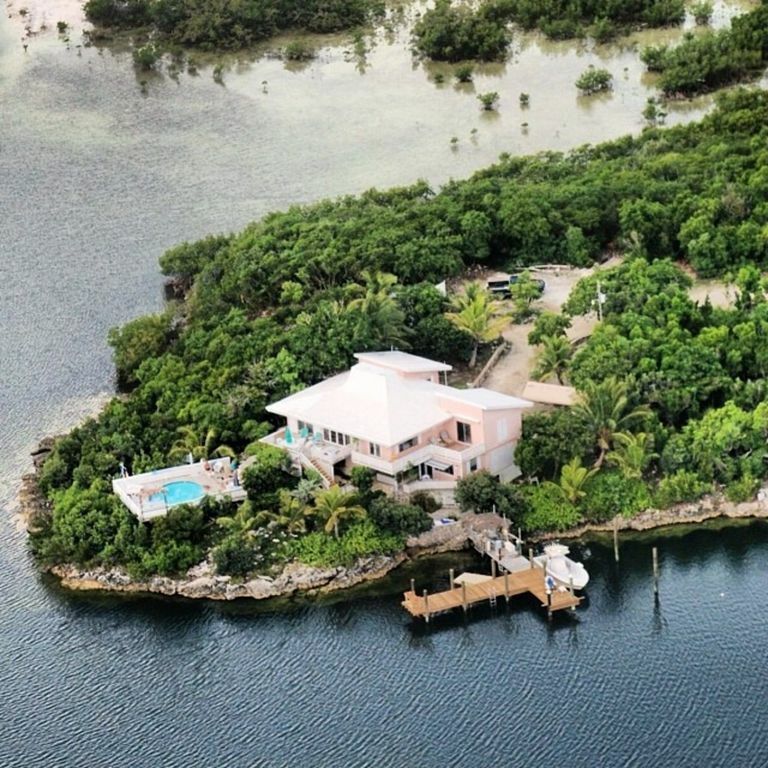 Charming and Secluded Home on the Bay with Pool, Dock, Views. Seaside Cottage is a unique 3,500 sq . ft. home located on a peninsula on a quiet harbour in the middle of a 6 mile long private island. A perfect get away situated in a wooded lot, 45 feet above the water. The house has quarry tile floors, bright tropical furnishing and a fully appointed kitchen with built in grill. The house has spacious bedrooms with vaulted ceilings, private baths and ceiling fans. French doors open out onto the spacious decks. The kitchen is open onto a great room which looks out over the water. French doors open out onto 3 sun decks which adjoin another deck surrounding a beautiful fresh water pool. The long deep water dock provides dockage for boats up to 50 feet in length. You can spend the day reading by the pool or taking a nap in the hammock in the shady waterside woods surrounded by native trees and wild orchids. Watch and feed the tropical fish at the dock. Bird watchers will delight in the numerous hummingbirds, heron's and cranes. Ammenities:: Your rental includes bicycles to explore the island. Boat rental is available to visit nearby uninhabited island where you may find some ruins of a 18th century old English village, or see the splendor of our many blue holes. Visit one of our beach front caves or see the spectacular views of the island from the high cliffs or at low tide you can walk the flats for shells and sand dollars.You have satellite TV, VCR, Surround Sound System, DVD movies, Phone, FAX and WIFI for your convience. For recreation we have a competition pool table, kayaks and many games, puzzles and books. The whole house can be rented as a 4 BR 3.5 Bath for $500 per night, or you can rent just the upstairs, 3BR 2.5 Bath for $400 per night.. You can also just rent the downstairs (Anglers Roost ) 1 BR Apt with full kichen, bath, fouton in living area and queen bed and a twin couch in the bedroom and large deck outside for $150 per night. The 1 BR apt can also be combined witih a master king bedroom upstairs with full bath and private entrance for a total of $250 per night. Dockage is free with rental but dock elec. is not. There is also a 1 BR OCEAN FRONT VILLA ( see photos ) for $145 per night. Transportation:: The following can be arranged for you: rental car, rental boat, bone fishing guide, sport fishing guide, snorkeling and diving, motor scooters, golf cart, FREE unlimited golfing on our 9-hole course. Flight packages are available from West Palm Beach, Nassau, or Ft. Lauderdale. We have several restaurant serving American and Bahamian cuisine. A full service marina is also available. There are many ways the home can be rented: The whole home with 4BR, 3.5 Bath can be rented for $500 per night , or you can rent only the upstairs of the house with 3 BR, 2.5 bath for $400 per night.. The downstairs full one bedroom apartment that consists of a bedroom with queen bed, full bath, kitchen , small living area with queen fouton and outdoor deck can be rented separately for $150 per night or it can be joined with one of the upstairs king master bedroom with full bath and private entrance for a total price of $250 per night. Regardless of what you choose, you will be the only guests . We do not rent both the house and the apt at the same time. The downstairs apt. is pictured in 4 photos after the picture of the pool. We have a 4,800 ft. airstrip with port of entry services. Two flights daily from Nassau. Along with a regular charter flight services from Ft. Lauderdale and Miami. I have cruised by boat in the Bahamas for many years and seen many island but when I came into Great Harbour , it was so beautiful and the people were so warm and friendly, I knew I was home. Being on a 6 mile island that is only a mile wide at the widest point, allows you easy and fast access to beaches, harbour, shelling and exploring uninhabited areas within minnutes. The house is on a large harbour opposite the marina, it sits on a pennisula that is surrounded on three sides by water and a large dock for boats and fishing. Clothes line and pins provided. We do not use dryer as electric is 70cents per KW and one load costs $20. Downstairs Apt has another kitchen with micro, large refrigerator, toaster ,2 burner cook top, dishes and pots and pans. 55 inch Satellite TV upstairs,24 inch tv downstairs. Fresh water pool with lots of chaise lounges, table chairs, bar, outside enclosed shower off pool deck , looking out at harbour. An amazing week in paradise with an amazing host! I knew after hanging up the phone with Ruthann that this was going to be an outstanding vacation, it started with our host picking us up at the airport , something we certainly didn't expect, she had bicycles, kayaks, fishing gear and nearly anything you would want that you were unable to bring over on your own to the island. our host took us on a guided kayak tour of the infamous shark Creek were we saw wildlife in and out of the water and tons of sunshine. When we would return from a day at the beach we would find ourselves floating in her freshwater swimming pool with a cold beer in hand, and at night we would fire up her stainless grill and throw a slab of meat on for dinner, if it's fish you want, she'll take you to the dock where her friends have an abundance of fresh fish caught daily as well as fresh Conch. We spent our time fishing off her dock which couldn't of been more than 25 steps from our cottage, we caught plenty of fish, Snapper, Grouper and Parrot Fish, We did rent a jeep that she reserved for us at the marina for the week of our stay ...$40 daily. My wife and I have flown or airplane in to many of the Bahama out islands but Great Harbor Cay is by far our favorite to date, the beaches are the most Beautiful beaches we've seen to date and the residents of the island were very accommodating as they have been freinds of Ruthann's most of their lives. Ruthann was a great host and now a great friend, we would like to return In May and do a little more fishing off that dock! A comfortable retreat, fully equipped house with great access to marina, harbor. The house comfortably slept our family of four with room to spare. The kitchen is fully equipped, and the owner Ruthan went to great lengths to provide us with all the gear we needed--kayaks, bikes, even fishing rods so our son could fish off the dock. The home is clean and the pool a great place to cool off after a hot day at the beaches. Ruthan also served as our tour guide extraordinare on the island. She was a wealth of information on the best places to kayak, the best beaches, where to eat and where to shell. I would highly recommend a stay at Ruthan's home, the combination of the owner's customer service and privacy of the large home is ideal for a Bahamian retreat. I wanted to write another review for Ruth Ann's villa as I have stayed two times since my first review. I HIGHLY reccomend her villa to any couple who is looking for a quiet beach getaway. GHC is a hidden gem in the Bahamas and I would go no where else for a tropical vacation. As always the villa was clean and homey and the complex is always quiet when we've been there. You have the beaches to yourself almost all the timeand just to be honest there is just no place like it. The people are wonderful & friendly and I just miss this place everyday. :) Ruth Ann is a great host who always takes great care of us. This place is worth the trouble to get to hands down bet vacation I have ever had... I am so glad I found GHC give it a try! Great Harbour, Great House, Great Hostess! What a wonderful vacation. The property located on the bay with easy ocean access, comfortably accommodated three families with children and two boats with room to spare. The kitchen (new remodel-not shown in pics) and house are fully equipped. Great fish cleaning station, BBQ grill and pool. Ruth Ann is the consummate hostess. She is so generous and always ready to inform you of the upcoming island events, nightly activities, and must see nearby attractions. We highly recommend her place for boaters and fishing families. We have stayed at her property on several occasions going back 12 years and will be back soon! All I can say is amazing, incredible and the owner, Ruth Ann Reichert made my group so at home and provided info and even got us a rental vehicle for our use before we arrived. She and her house was amazing. The Great party for my group was there was a pool, a billard table, and docking for our boats and for our kids to fish. This place is awesome and had every thing a family or fisherman could and would need. We stayed at Ruth Ann's little villa & had an absolutely wonderful vacation. We have been to GHC many times, usually staying in a house on the beach. This place is comfortable and cozy perfect for a couple. I loved the loft and the comfy bed and the shower in the bathroom was excellent. Ruth Ann is a great lady and what I can I say I fell in love with GHC years ago and I just need to come back! I would definitely recommend her place and her home also.